‘Text’ originates from the Latin word texere, to weave. A material craft enabled by a human ingenuity for loops, knots and pattern. Whereas a single thread may collapse under its own weight, looped and intertwined threads originate their strength and texture as a network. The textile speaks of repetition and multiplicity, yet it is only once we back away from the tapestry that the larger picture comes into focus. At an industrial scale textile looms expanded beyond the frame of their human operators. Reducing a textile design to a system of coded instructions, the complex web of a decorative rug could be fixed into the gears and pulleys that drove the clattering apparatus. In later machines long reels of card, punched through with holes, told a machine how, or what, to weave. Not only could carpets and textiles themselves be repeated, with less chance of error, but the punch-cards that ordered them were now equally capable of being mass-produced for a homogenous market. From one industrial loom an infinite number of textile variations could be derived. All one needed to do was feed more punch-card into the greedy, demanding reels of the automated system. The material origins of film may also have been inspired by weaving. Transparent reels of celluloid were pulled through mechanisms resembling the steam-driven contraptions of the industrial revolution. The holes running down its edges delimit a reel’s flow. Just as the circular motion of a mechanical loom is translated into a network of threads, so the material specificity of the film-stock and projector weave the illusion of cinematic time. Some of the more archaic, out-moded types of film are known to shrink slightly as they decay, affording us – the viewer – a juddering, inconsistent vision of the world captured in the early 20th century. Rather than Manovich’s ‘slave’ / ‘master’ relationship, I want to suggest a kind of lateral pollination of media traits. As technologies develop, specificities from one media are co-opted by another. Reverting to biological metaphor, we see genetic traits jumping between media species. Media history is littered with exaptations. Features specific to certain media are exapted – co-opted – as matters of convenience, technical necessity or even aesthetics. Fashion has a role to play also, for instance, many of the early models of mobile phone sported huge, extendible aerials which the manufacturers now admit had no impact whatsoever on the workings of the technology. 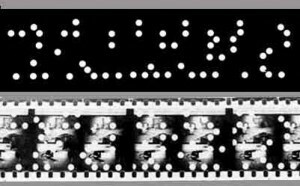 Lev Manovich’s suggestion is that as the computer has grown in its capacities, able to re-present all other forms of media on a single computer apparatus, the material traits that define a media have been co-opted by the computer at the level of software and interface. A strip of celluloid has a definite weight, chemistry and shelf-life – a material history with origins in the mechanisms of the loom. 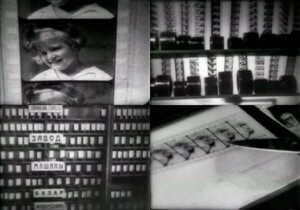 Once we encode the movie into the binary workings of a digital computer, each media-specific – material – trait can be reduced to an informational equivalent. If I want to increase the frames per second of a celluloid film I have to physically wind the reel faster. For the computer encoded, digital equivalent, a code that re-presents each frame can be introduced via my desktop video editing software. Computer code determines the content as king. In the 1960s and 70s Roland Barthes named ‘The Text’ as a network of production and exchange. Whereas ‘the work’ was concrete, final – analogous to a material – ‘the text’ was more like a flow, a field or event – open ended. Perhaps even infinite. This semiotic approach to discourse, by initiating the move from print culture to ‘text’ culture, also helped lay the ground for a contemporary politics of content-driven media. “computable” here mean[s] to be limited, finite, bound, able to be reckoned. Written twenty years before the advent of the microcomputer, his essay stands in the ironic position of anticipating what it cannot anticipate. It calls for a movement away from works to texts, a movement so successful that the ubiquitous “text” has all but driven out the media-specific term book. Hayles notes that the ‘ubiquity’ of Barthes’ term ‘Text’ allowed – in its wake – an erasure of media-specific terms, such as ‘book’. In moving from, The Work to The Text, we move not just between different politics of exchange and dissemination, we also move between different forms and materialities of mediation. To echo (and subvert) the words of Marshall Mcluhan, not only is The Medium the Message, The Message is also the Medium. …media are only a subspecies of communications which includes all forms of communication. For example, at first people did not call the internet a medium, but now it has clearly become one… We can no longer understand any medium without language and interaction – without multimodal processing… We are now clearly moving towards an integration of all kinds of media and communications, which are deeply interconnected. haven’t a clue what this essay is about. I would love to know whether you are still in the dark and why.